Transmission suggestions for whiteblock powered 4x4? 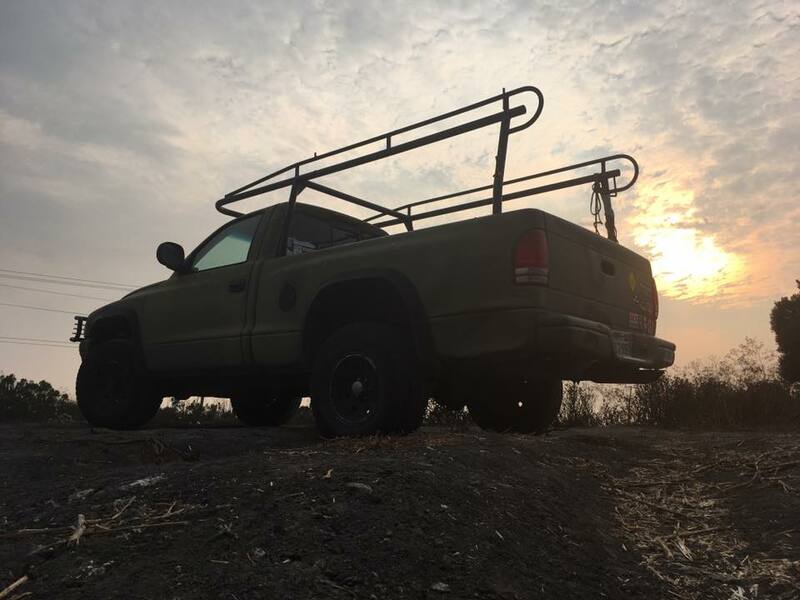 So I've owned a 1997 Dodge Dakota 4x4 since I was 16. It was my very first vehicle. The 318 is getting a little tired and it's leaking oil. There is absolutely no way I am getting rid of this truck. I've thought about making it pretty again, but it's a work truck and it has picked up a lot of character I dont want to erase over the years. I have a nice engine from an OBD2 95 960 that I could disguise as a 98 S90 powerplant so I could get through a smog ref [engine going in has to be newer than the chassis]. I'm obviously not going to be using the stock volvo trans so an ECU reflash to eliminate the trans altogether to make it get through inspection with no CEL. Because the S90 was never offered here with a manual, I would have to use an auto which I am okay with. Yes, that combo will a tad slower than a tired stock 318 [its only to make it "legal"] but I do feel like there will be room [literally since there is a lot of engine space] for that to grow especially with a different ECU and maybe a turbo. KLRacing makes a GM auto adapter for the whiteblock, and I have been reading up on some 4X4 forums about GM 4x4 automatics being adapted to the stock NP231 transfer case on the Dakota very easily. Other than finding the adapter plate, I have not seen much info on what else people have done for adapting TC's, etc. I need to work on my google translate skills to find stuff over on some of the scandinavian forums. I do have a rough idea of what needs to be done in my head though but seeing what others have came up with would be nice. Jeep Cherokee used an AW-4 transmission with the 4 liter straight 6 which is supposedly related to the AW30-43LE (A43DE). Also related to the Toyota A340. Has removeable bell housing. May be able to use the White Block Bell housing on the AW4 transmission. The AW4 was used in 2 wheel drive models and also in 4 wheel drive versions but probably have differing output shafts. My friend put a 360 in his 94 Dakota. I think he keep the 318 computer. You're in CA.... forget turboing a whiteblock. Yeah you can do a 360 just plug-n-play. Or, Lummert is right. The AW4 is the same trans as the AW30-40 that comes with the B6304. California engine swap rules say that the engine must be from the same type of vehicle that it is going into. It definitely means no truck engines in passenger cars, It probably means no passenger car engines in a truck. Do your homework before you start tearing into it. AW4 from a Cherokee up to 95 would be your best bet. The controls changed in 96 when they went to OBDII, so the AW4's had Dual VR speed sensors. One at the tail shaft and one at the torque converter. 95 and earlier had just a reed switch internally for output shaft signal. Depending on how the trans controls in the ecu you want to use works, you may find that one of the two may just work, solving that issue. Otherwise, the AW4 equipped Cherokees had external trans control modules you could simply wire up for trans control. It's best to take the trans control from the same year vehicle as the trans, same exact vehicle preferably. The AW4's already have a 231 or 242 attached, so that makes the TCase and 4wd part easy. Bellhosuings swap amongst all the AW4, AW30-40, and A340 transmissions. There are, however, three different input shafts I've come across so you may want to take a stroll around the junk yards and see if the Volvo converter will slide into an AW4. The volvo torque converter is really high stall. Like 2500 rpm or something. I'll talk to a ref. Put a Jeep Cherokee 4.0L in the Dodge Dakota. That 1300whp redblock in a dakota body drag chassis was pretty inspiring eh? Lemme finish the rally car first. Once it's running and driving I will have a free bay to mess with at the shop. I just want to start kicking around ideas on how this all will work in the meantime. Glossing through the 960 and V90 wiring diagrams tonight, looks like trans control on both of those cars are the same. There's one extra solenoid in the 960/V90 trans the <95 jeep transmissions don't have. Only thing I can think of is line pressure. For some reason I thought line pressure on 960/V90 was cable controlled like the AW4. I could be wrong. Only other difference I see is the 960/V90 shifter signal logic is a bit more complex than the Jeep. Should be as easy as swapping the shift switch on the trans linkage, or at the shifter. The difference in just the solenoid, whatever it does, shouldn't be a detriment. What I'm seeing so far, you can use the factory Volvo controls on the AW4, eliminating the need to reflash for your application. Check out this thread. That document explains what everything is. That solenoid does control line pressure. Seriously, huge thanks for the information you guys. I know I have not even started on this yet, but it is giving me a really good idea of how it is going to come together.